The Lido Isle Women's Charitable Foundation is putting on their 6th annual "Home for the Holidays", touring 3 beautiful Lido Island homes dressed up to the nines with holiday goodness. The Tour is this Thursday, December 3 from 11:00-3:00. Read more information and how to get tickets here. The Newport Shores Holiday Home Tour is this Sunday, December 6 from 2:00-5:00pm. This is an annual event and this year the proceeds will provide gifts for the military troops who are stationed in Iraq. Find more information here. The Balboa Island Walking Holiday Home Tour is Sunday December 13 from 11:00-4:00 pm. More information available here. 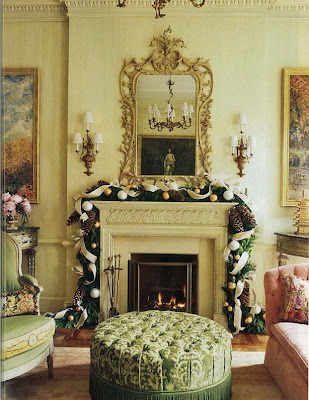 And in case anyone is lucky enough to be heading off to the Big Apple in the next week or two, you can tour The Holiday Showhouse on the upper east side with some big name decorators like Charlotte Moss, James Rixner, and Eric Cohler. The showhouse is open until December 14 in NYC. Read more information on Charlotte's website here. *The photo at the top is from Charlotte Moss's spread in the Nov-Dec issue of Veranda. Amazing as always.